what a great photo, and a terrific link between you and your roots! The photo has been in the family all along, but it never really registered with me till I started riding a bike again myself. 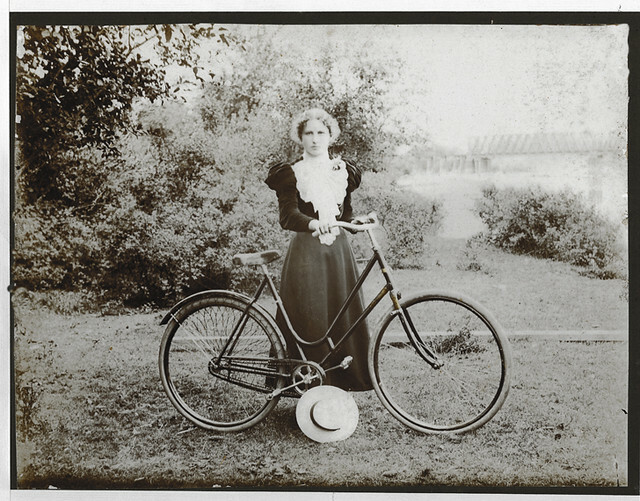 My sister, a much more avid cyclist than I am, bears the greatest physical resemblance to this grandmother, and has always had a special place in her heart, and on her wall, for this image. She even had a sepia-toned photo done of herself in the same pose a few years ago. Lordy! Fancy trying to ride a bike in that skirt! I ride my bike in a skirt kind of like that routinely. It's not quite as long, but almost. With the step-through frame (formerly known as "a girls' bike"), a covered chain, and a skirt guard (that extra string mesh covering the top half of the rear wheel), riding in a skirt or a long winter coat works quite well. Mind you, sweating a lot in that velvet top would be problematic. My solution to that sort of thing? Slow down. What a fab picture of your great-grandmother. It's nifty that cycling is in your blood, so to speak. Yost is a not-too-uncommon surname in the US. It probably ultimately connects back to the Norman surname Joyce. I think in the case of my family it made a detour to the Netherlands and arrived on these shores as Jost or Joost before being anglicized with the Y.